I know I already posted about the Writers’ Workshop Festival of Writing in York, and I had decided not to publish a list of what I learned because others have already done that so well, but – I changed my mind! And here’s why: I learned some great stuff that I want to remember, especially about characters and revision. Maybe one or two of these will be helpful to you too. Novels sell because readers fall in love with your character(s). This tip is courtesy of Shelley Harris (and any inconsistencies between my interpretation and these authors’ intentions are my fault alone). And interesting characters are characters in action, of course. A lot of us have read articles exploring which is more important, plot or character, and we can probably all agree that both are necessary. But I don’t think Shelley’s point was really addressing this debate. It was about the importance of creating a character who is so compelling and does such interesting things in such an interesting way that you can’t forget her or him. I just finished a book with a pretty good plot, and the characters weren’t bad either. I even felt empathy for the main character. But there wasn’t anything special about her that I grabbed onto. I’m pretty sure this novel will fade from memory rather soon. Take the time to think deeply about your characters and define them, because this is what will give your story its heart and its fuel. (Inspired by Julie Cohen.) While Shelley gave us pointers on what to focus on to get published, especially the focus on character, Julie’s workshop gave us the “how.” Hers was an ideal session of directed learning by doing, where we created a character during the course of an hour, fueled by Julie’s brief but significant explanations. During her workshop I realized how taking the time to get a clear visual picture of your character, defining her strengths and weaknesses (which could well result from the same trait or source), and imagining how she would react to a particular, charged situation, could substantially drive the course of the plot, and, in fact, define it as well. The character I created in the workshop, Felicity Fox, white-blonde, skipping down a hallway in her white pleated skirt carrying a candle snuffer, is still haunting me. Listen to your characters. This (and many other words of wisdom) came out of the Self-Editing Your Novel mini-course given by Debi Alper. While structured thinking is important, especially when revising, Debi’s point was that if you’re too tied to what you’ve preconceived, you might miss out on some great material from your subconscious mind. What’s the risk if you follow your characters? Nothing, really. You can always delete later on. But, more likely, the characters will know best. This has happened to me more than once, and I’ve always been grateful that I listened, but now I’m going to try to be even more open to what my characters tell me. Don’t fiddle. This last piece of wisdom comes from Emma Darwin (and if you have any questions about the writing process at all, just visit her blog). This means, don’t go back and review your words because you’ve hit a little hitch in your writing, or you’re tired, or you want to bask in the glory of that passage you wrote last week. When Emma asked the room if anyone had ever done this, hands went up all over (including that of yours truly). The problem is, if you read over your work just because (NOT because you’ve come back from vacation and need to get reacquainted with the manuscript you promised yourself you’d work on every day, or you don’t remember a plot thread that has a bearing on your next chapter), you lose that distance between yourself and your work that you need to revise effectively. And, chances are, you’re liable to make little changes here and there that you’ll regret later. The charming turn of phrase you decide to insert which seems to have materialized out of thin air may well be something you’ve already put into your manuscript a few days ago (that why it fits so well! ), and it’s really annoying to discover this and have to change it back later. This has happened to me more than once; it’s worse than standing still – it feels like going backwards. To combat this tendency, Emma suggests that we don’t sit down to write until we’ve decided what we’re going to work on that day. Have a purpose, always. Writing is a craft. I’m embracing this truth after some years spent dabbling, thinking my writing prowess would either appear full-blown, because I was truly gifted, or I would just have to quit when it became obvious that masterpieces weren’t flowing from my brain onto the page. The funny thing was that even though these masterpieces didn’t materialize, I didn’t give up. And it was the right decision, because now I know I can keep working at it, just like all the other writers out there, and get better. The York Festival was so great because it affirmed my commitment to writing: to spend the time, to keep practicing, to accept it as an essential part of my life. Great tips to pass on and how spooky, I’ve just been followed on twitter by a Felicity Fox! Hi Jane, and thanks for the lovely comment. The conference was worth every penny (or pence! ), even including my plane trip to Manchester. Of course, I jump at any chance to go to England. 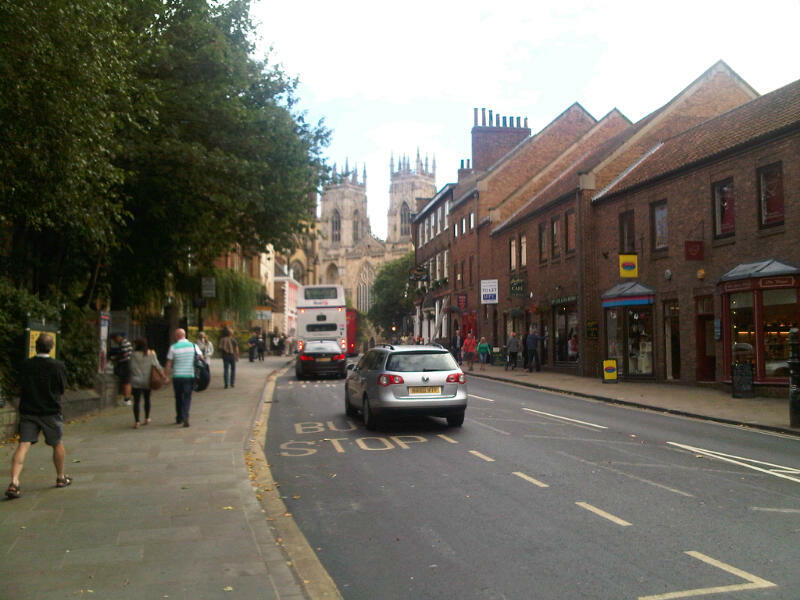 It was also wonderful to get back to York – I realized when I was there last I was exactly half the age I am now. Too long! Hey, nice list, and good writing advice. It’s always encouraging to go to an event and hear from people who’ve been through the same things. Writing is a craft indeed, a point that should be obvious but that took me a long time to realise. Pianists don’t expect to play perfectly without practice. But because almost everyone can write, we forget how hard it is to write really well. It’s a lifetime’s work, and I’m learning all the time. Thanks for sharing what you learnt at the festival, Kristin, and good luck with your writing.